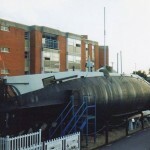 Today in Gosport’s Past:- on 28 February 1978, HMS “Alliance” was transferred, on permanent loan to the Royal Navy Submarine Museum. 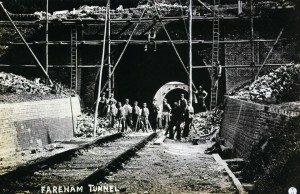 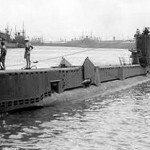 The submarine was ordered in October 1943 as part of the emergency war programme; builders were Vickers Armstrong of Barrow-in-Furness, and she was laid down on 13 March 1945, launched at Barrow on 28 July 1945, and commissioned on 14 May 1947. 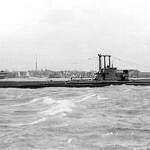 Allocated pennant number P417, she was an ‘A’ Class submarine (aka ‘Acheron’ or ‘Amphion’ Class), arriving too late for war service. 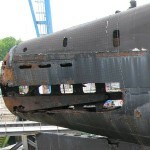 She underwent extensive modernization between 1958 and 1960, with the deck gun being removed and the conning tower, hull, and fin were streamlined, giving a completely different appearance. 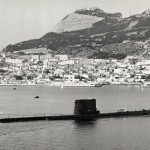 In May 1961, all surviving submarines completed since the end of WW2 were renumbered from S01 upwards, “Alliance” became S67. 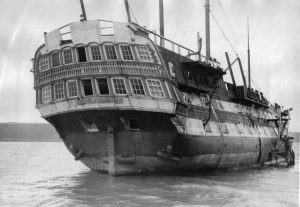 She was grounded at Bembridge Ledge on 12 January 1968, and rescued by tugs. 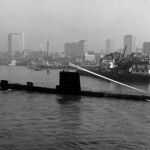 A battery explosion at Portland occurred onboard on 30 September 1971, resulting in at least one fatality. 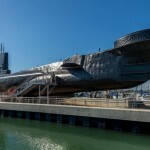 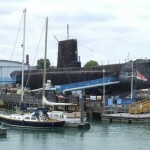 From 1973 until 1979, she was the static training boat at HMS Dolphin, and was towed to Vosper’s Southampton yard in August 1979 for strengthening of the hull, to enable her to be exhibited out of the water at the Royal Navy Submarine Museum at Haslar. 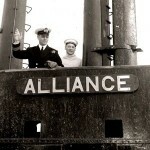 A museum ship since 1981, “Alliance” is listed as part of the National Historic fleet. 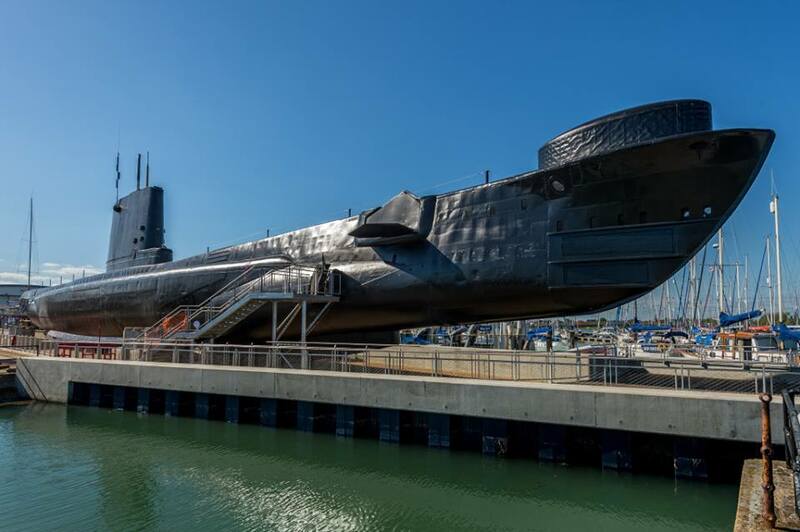 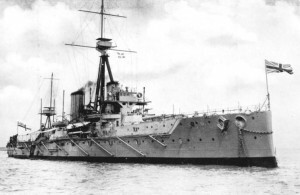 A number of corrosion problems (not least were those caused by c.100 pigeons living within the hull) costing £3.4 million to fix were, with the aid of a National Lottery grant, repaired between 2011 and March 2014. 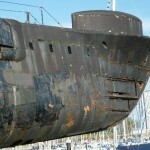 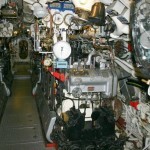 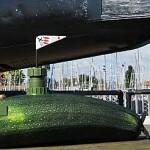 The Submarine Museum, which also houses Britain’s first submarine “Holland” is well worth a visit. 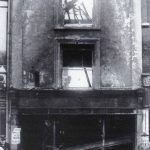 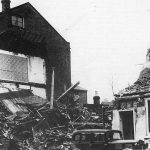 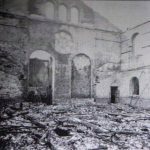 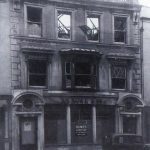 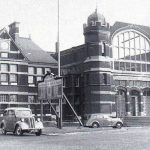 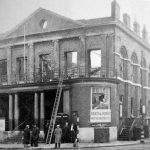 ALSO Today in Gosport’s Past:- on 28th February 1941, following an overnight German air raid, Gosport found itself without a police station; the station, in South Street was hit, and considered as ‘destroyed by enemy action’. 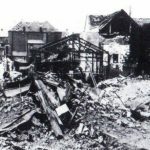 Although I haven’t been able to discover any other casualties of this particular raid, Gosport was badly affected by air attacks during World War Two, particularly in 1940 & 1941. 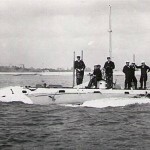 The worst raids occurred on 12 and 16 August 1940, and 10 January, 10 March, and 14 June 1941. 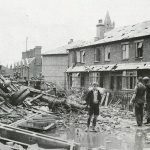 During the whole war, the town experienced 1,591 alerts and 61 raids; over 400 high explosive bombs hit Gosport (plus another 200 or so landing in creeks etc), and over 10,000 incendiary bombs were dropped. 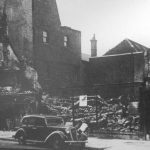 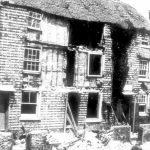 The Gosport statistics for WW2 were 114 deaths, 454 properties were destroyed, 933 badly damaged, and 10,866 damaged with more than just broken glass, out of a total of around 13,000 buildings at the outbreak of the war. 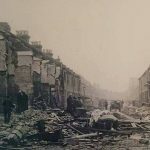 Here’s a list of roads & locations which suffered bomb damage during that time (these are just those I know of, I daresay there were more):- Admiralty Terrace, Anthony Grove, Avenue Road, Beach Street, Bemisters Lane, Bournemouth Avenue, Bury Hall Lane, Chapel Row, Church Path, Dolman Road, Dunkeld Road, Eastbourne Avenue, Elson Lane, Elson Road, Fisgard Road, Fort Blockhouse, Fort Brockhurst, Forton Road, Gordon Road, Gosport engine shed, Gosport station, Grange Airfield, Grove Avenue, Grove Road, Hamble Road, Hartington Road, Haslar Bridge, Hastings Avenue, High Street, HMS Daedalus Airfield, Holly Street, Joseph Street, Lavinia Road, Leesland Road, Marina Buildings, Mayfield Road, Moreland Road, Prince Alfred Street, Queens Road, Richmond Road, School Road, Selsey Avenue, South Street, Spring Garden Lane, St Andrews Road, St Edwards Road, Stoke Road, Sydney Road, The Avenue, the fuel depot, the market house, the police station, The Ritz, Thorngate Memorial Hall, Village Road, The Whitworth Arms pub, and Zetland Road. 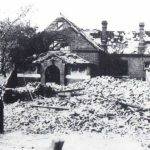 The attacks on the airfields largely involved Stuka dive bombers. 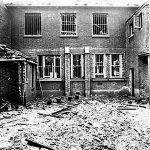 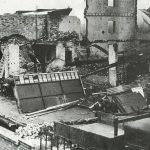 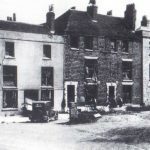 The first photo is of the wrecked police station, taken after the war, before it was demolished; the rest are of general bomb damage incurred in the town area, plus one of the immense damage incurred in Avenue Road. 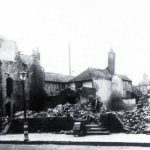 These are mostly from the bombing raids of 1940/41.